Here are the three most important things for you to take out of this experience. It was incredibly hard to choose and the standard of entry was phenomenal but, the winner of our competition is Steven Solis for the two pictures above (Jon likes the black and white one, I like the one on the street sign, both were taken by him). Congratulations. Send me your postal address so I can send you a signed copy of I Wrote This For You. The competition went so well, we're going to run another one. So, scroll down after point three to see how the next one will work. 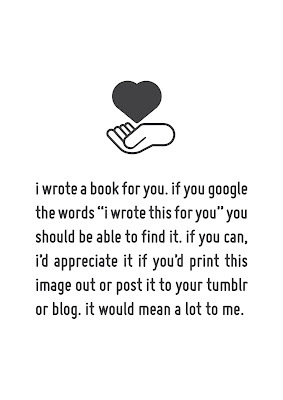 This is actually quite big for some people I think: I Wrote This For You is now available in new, white tumblr flavour. Click here to check it out. It'll be updated at the same time as the main site and also include whatever we deem to be in the spirit of I Wrote This For You. To enter the next competition, you have to redesign/photograph/draw/interpret the message above, without changing the words. You could draw the words on your arm in sharpie, write it in the sand at the beach, paint it on a wall, whatever you think is best. Then, send it to me at pleasefindthis at gmail dot com. 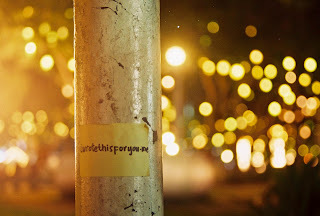 The most creative entry wins a signed copy of I Wrote This For You as well as my love and respect. The deadline is the 9th of February, so you have a month from today. I wish you all the joy in the world and hope everlasting. So there are no restrictions at all?? when you say "without changing the words," do you mean we have to use every word of the text in the image? i didn't quite get the instruction? which message exactly should we not change at all? the whole text "i wrote a book for you. if you google the words.......it would mean alot to me." 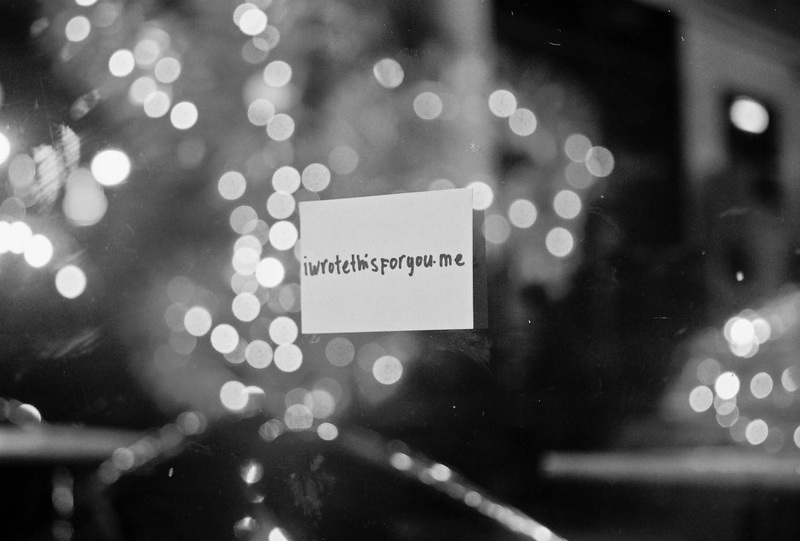 or the just the phrase "i wrote this for you" ? 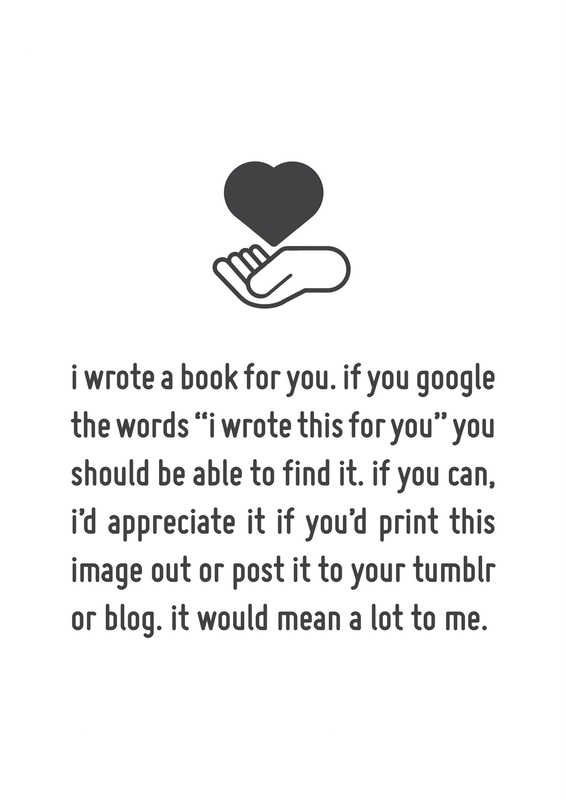 I'll be posting some entries later on today as a reference, you can change the text if it's too long (I'm referring to all the text in the instruction, not just 'i wrote this for you') but I'd prefer it if you didn't.